This Week, The Baptist Generals Held Their Ground. 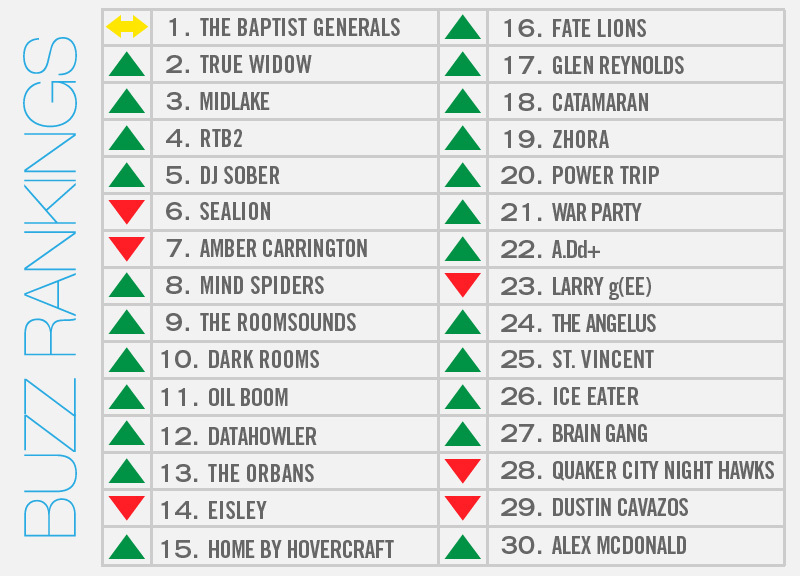 Still riding high off the release of their brilliant new album last week, Denton luminaries The Baptist Generals find themselves atop our rankings for the second straight week. 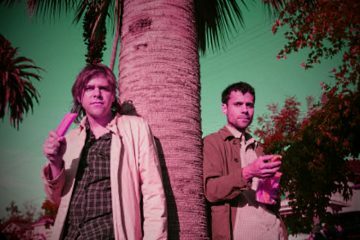 That much makes sense: If we as a city hadn't forgotten about the band, which until recently had been fairly dormant, during at least some point over the past several years, then it only makes sense that we wouldn't have moved on from them prior to their first proper album release show. This Saturday at Dan's Silverleaf, the Generals stand to prove what we've been saying all along — that the newly released Jackleg Devotional to the Heart is, indeed, worth the 10 years we had to wait to finally hear it. As such, we expect the band's upcoming gig to be one of the most buzzed-about shows of the entire weekend. And, soon after that performance, The Baptist Generals are set to head out on the road with The Mountain Goats. Potentially giving that show a run for its money buzz-wise, so to speak, would be True Widow's performance as the opening act for their Relapse labelmates in Baroness on Friday night at Trees. The self–proclaimed “stonegaze” trio is less than two months away from releasing their debut for that label, so expect to be bombarded with a whole slew of trudging new riffs from their upcoming Circumambulation, one of which debuted on Vice's music site, Noisey, earlier today. Likewise, Midlake joined their fellow local heroes in earning a small bit of national buzz for their next album when they blasted their social media sites with news of the long-coming effort's completion. Actually, there are a whole string of bands who released albums in the last week — or ones who will otherwise be releasing albums in the coming week. Basically, we're currently smack dab in the midst of the heaviest local release season we might face all year. 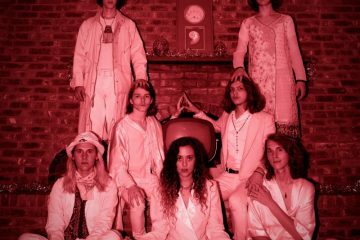 We'll submit new full-lengths, EPs, and singles released by The Baptist Generals, Dark Rooms, Sealion, Datahowler, Eisley, Home by Hovercraft, Glen Reynolds, Catamaran, St. Vincent, Ice Eater, Cas Haley, Fox and the Bird and The Hanna Barbarians as all the evidence required to prove as much. Elsewhere, RTB2, The Orbans, The Roomsounds, Oil Boom and Fate Lions represent the local faction playing this weekend's KXT Summer Cut festival; as Adam Levine's only team member saved by America's votes on this week's episode of The Voice, Amber Carrington found herself in the middle of I-hate-this-countrygate; Mind Spiders opened last weekend's Black Flag show; DJ Sober celebrated his birthday with a bash at It'll Do; and Larry g(EE) performs at Sundown tonight as part of this month's Chevy North Texas Music Showcase.